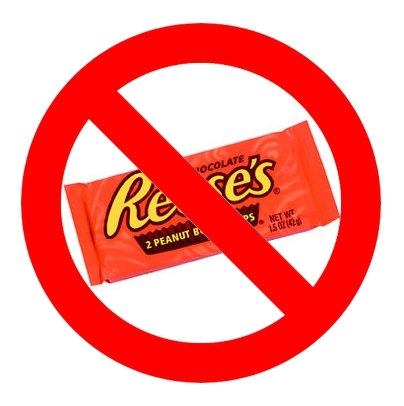 Say no to Reese’s, and YES to Camino! There is one food combo that I love probably more than anything else in the world: chocolate and peanut butter. In fact, I just finished an Auntie Loo’s chocolate and peanut butter cupcake. It was divine, and a lovely occasional treat. And who didn’t love Reese’s Pieces and Reese’s Peanut Butter cups when they were kids? Heck, I imagine most adults probably still love them. But for vegans and anyone even remotely health conscious, they are pretty sinister; chock full of saturated fat and hydrogenated oil, not to mention cow’s milk derivatives. It’s amazing how a childhood treat can look so different through the vegan lens. I used to make my own peanut butter cups at home, using melted fair trade organic dark chocolate, organic peanut butter, and icing sugar. And Alicia Silverstone has a good recipe for them, which you can find here. They’re great, don’t get me wrong. But they require time and effort, and sometimes I just don’t have that. And sometimes Auntie Loo’s is closed. So what’s a choco-pb fiend to do? Thankfully, Ottawa-based Camino has come up with a fantastic solution: chocolate and peanut butter snack bars. They also make them with almond butter. The 180 calorie bars are organic, vegan, and fair trade. But perhaps most importantly, they are absolutely delicious. You can buy them for between $1.39 and $1.79 at places like Rainbow Foods, Herb and Spice, Natural Food Pantry, and Bridgehead. Find out more information on their Web site. They are also super convenient. You can add them to your purse food repertoire. A great purse food option. A word of warning though: These are highly addictive. They say the first step to recovery is admitting you have a problem, right? Well, I kind of have a problem. They are currently my favorite thing to eat. I still forcefeed myself vegetables, fruits, and whole grains, but it’s Camino snack bars I’m yearning for. What’s not to love? They are every bit as delicious as a Reese’s PB cup, without the bad stuff, and with many additional benefits. So pick one up soon, and get ready for deliciousness! I love PB rice krispie squares with chocolate.. but lots of the evil corn syrup in them. the excellence of PB & chocolate is pretty much unknown to the irish. We have a peanut butter-chocolate pie at ZenKitchen that’s gluten- and dairy-free and tastes just like Reese’s. It’s my fave! I haven’t had it Dave… I’m always too busy gorging on the spicy mexican chocolate cake! Does anyone have the recipe for the vegan chocolate peanut butter rice krispie squares from Herb & Spice? They are absolutely to die for!